Heavy rain and damaging winds lashed Long Island in a thunderstorm that briefly prompted a tornado watch for Nassau County on Monday morning. But the storm was ending as of 8 a.m., then turning to showers, the National Weather Service said. “As we get towards the afternoon, the weather gets better: a mixture of sun and clouds,” News 12 Long Island meteorologist Rich Hoffman said. Highs should reach nearly 60 degrees and showers should end by 11 a.m., the weather service said. The overnight lows should be in the upper 30s. “We had some damage overnight,” Hoffman said early Monday morning. 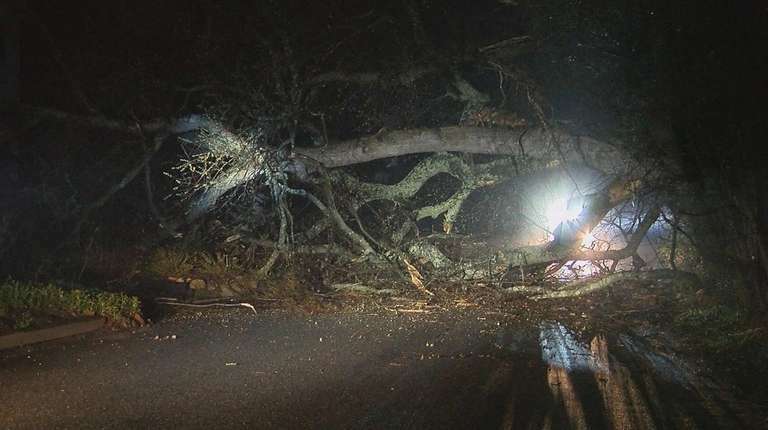 Suffolk County police said there were reports of downed trees in Shirley and South Huntington. Nassau County police had no incidents to report. “A 911 caller reported a tree fell on the house and broke through the roof,” police said of the Shirley case. There were no injuries. In South Huntington, the tree fell in the yard. Long Island generally got half an inch to an inch of rain through about 7 a.m., said Melissa DiSpigna, a weather service meteorologist in Upton. There were about 3,000 customers affected by power outages before the storm ended, according to PSEG Long Island’s online map. Southern Nassau and all of Suffolk will have a wind advisory from noon Monday to 2 a.m. Tuesday, warning of the possibility of difficult driving, especially for high-profile vehicles in open areas. “We could have some more power outages and trees down later today,” Hoffman said. Winds could gust as high as 44 mph in the afternoon and may continue into the night, but will be less intense, the weather service said. On the Long Island Rail Road, there were 10- to 15-minute delays for a few stretches throughout the morning due to “weather-related signal trouble,” the railroad said in advisories. There were marine warnings for the waters off both coasts of the Island, as well. As for tornadoes, “spring is typically when you see them,” DiSpigna said. “Potentially multiple rounds of fast-moving storms will cross the region through the overnight and early morning hours of Monday,” the National Weather Service said in the tornado watch, which stretched from Maryland to Connecticut and was canceled for Nassau County before 5:20 a.m.
Tuesday should be sunny and breezy with highs near 60 and lows in the mid-40s. Wednesday should be slightly cooler and partly sunny with highs in the upper 50s. Rain could return on Thursday, with highs in the upper 50s.